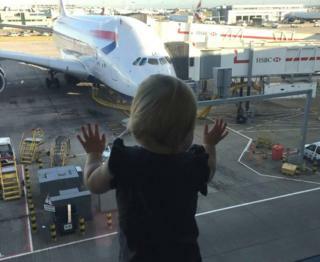 Darcy Davidson is not quite two years old but she has already clocked up more air miles on business travel than most adults. It wasn't planned like this. Her mother Laura had intended to take time away from the business she runs with husband Craig but Darcy arrived early and forced them to look again at their plans. With their business expanding rapidly, putting everything on hold for a year or two didn't seem like a good option. Laura and Craig's digital advertising firm works in 46 countries and means they need to regularly travel all over the world. The couple decided that meant their newborn daughter should travel too. Darcy's first trip was to Dubai when she was just 12 weeks old. "It was good that we were flexible to take her with us but taking a newborn baby across the world has its own challenges," Laura says. Their company, Tag Digital, is headquartered in Glasgow and has offices in London and Dubai. Turnover has been in excess of £2m in the past year and is projected to be £6m by 2019 year-end. The company had been going for a couple of years and was expanding rapidly when Laura realised she was pregnant. Darcy's birth came six weeks ahead of schedule. "That threw us a bit because I planned to take some time out of the business and then before I was able to do that she arrived nice and early," she says. "So we weren't very prepared for that." Laura says she was back in the office three weeks after giving birth. Even in her hospital bed, she had been firing off emails to explain why there were business meetings she just couldn't make. Returning so soon, bringing a young baby with her, much of it came down to improvisation. "There was a lot of just juggling, bringing her with us and just trying to keep the business afloat," she says. When Laura did leave Darcy at home it also led to practical problems. Laura says: "I was speaking at a conference in London at Chelsea Football Club and Darcy was only seven weeks old but I decided to fly without her. "So you're having to express breast milk in the hospitality suite at Chelsea, and then they confiscated the milk on the way back at Heathrow." So when Laura decided to bring Darcy with her on trips, she was often surprised how positive people's reactions could be. "People were friendly about it," she says. "She was really good in the early days and I think some people thought we were a bit mad for taking the baby along." As a very young baby, Darcy spent much of the time sleeping through meetings. Laura says: "People see what you're doing and they understand, they've been in that position themselves so I think it's good to have that human connection." Some clients saw Darcy's presence as an indication of how committed their parents were. "I think because I was back to work so quickly people were glad that you prioritised their needs as well as your own," she says. The firm's next step should be an office in the United States, opening in 2019. Laura, Craig, and Darcy relocated to Los Angeles for several months last year to expand the US business. There was no way to explain to a child about time zones, and Darcy took a while to adjust. Initially, breakfast time just had to be at two in the morning. And the journey home brought a challenge of its own. "Then we all contracted Norovirus on the flight home," Laura says. "So 11 hours with a vomiting one-year-old is not much fun on a plane." Meanwhile, the business has been achieving recognition as it expands. It was chosen for the inaugural Scale-Up Scotland programme, which selects businesses already turning over at least £1.5m which are seen to have the potential to grow further. The company is also a Google Premier Partner, and has been nominated in the International Expansion of the Year category for this year's Barclays Entrepreneur Awards - having already the regional award for Scotland and Ireland. So should other people, looking at what Laura and Craig have done, try to combine ambitions for their business with looking after a young child? Laura is in no doubt. "There's no good time to start a business and there's no good time to have a child. "Sometimes I think you just have to go for it and hope for the best. "It always works out OK in the end."